"The core gameplay involves transporting "spirits" within protective bubbles through varying environments. 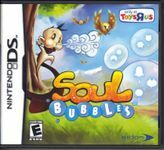 Bubbles are moved by being blown by the main "spirit herder" character based on stylus strokes on the DS touch screen. Bubbles may be created, joined, split, deflate and burst using animal "masks", worn by the spirit herder, again using the touch screen. These mechanics are then used to navigate through levels featuring wind currents, enemies, water, fire, gases, spikes, sticky surfaces, and further complexities. At the same time there are collectible "stardust" items that contribute to the player's end-of-level score, and "calabash" that unlock additional levels." Source: Wikipedia, "Soul_Bubbles," available under the CC-BY-SA License.